However, if left untreated, it can lead to severe scarring of eyelid, loss and misdirection of eyelash and even ulceration of the cornea. 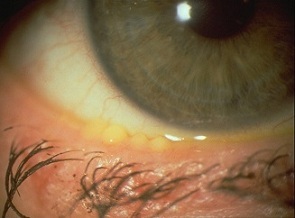 Till date, it is unclear about the exact cause of this eyelid inflammation. Notice the visible capillaries and directions of the eyelashes? The bacteria infection can cause loss of eyelashes and dandruff like scales to form along the lashes and the edges of the eyelid. 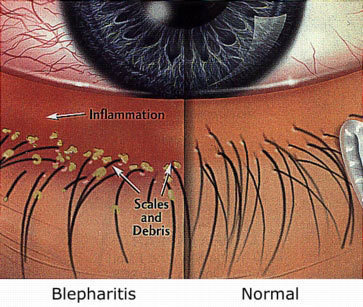 Bacteria induced blepharitis is usually more severe. Stye - a pimple-like bump caused by bacterial infection of clogged oil gland. Chalazion - a painless round lump that is caused by inflammation due to clogged oil glands. Occurs mainly on the inner eyelid. Pink eye (conjunctivitis) - recurring inflammation of the conjunctiva (a thin layer of membrane between the inner surface of the eyelids and the whites of the eyes). Dry eye - excessive tear evaporation due to reduced oil production. Changes to the eyelash - severe loss in numbers and misdirection. Difficulty in wearing contact lens - due to lack of quality tear film. Corneal ulcer - constant irritation from inflamed eyelids or misdirected eyelashes may cause an open sore to develop on your cornea. A one-off complete cure doesn't exist yet. Warm compresses and eyelid massages - to improve blood circulation and loosen oil ducts. Regular eyelid scrubs - to remove debris and bacteria. Antibiotics - if suspected to have bacterial or viral infection . Artificial tears - to relieve dry eyes. Steroid eyedrops or ointments - to reduce inflammation. Nutritional therapy (Omega-3) - Promote proper regulation of oil glands. For more details, please see Treatments For Blepharitis.